» Smelly sludge — a way forward? Smelly sludge — a way forward? One of the old tanks at the Albany-Millersburg sewage treatment plant, in a shot taken last week. After years of study and weighing alternatives, Albany public works officials say the best way to deal with smelly solids at the Albany-Millersburg sewage treatment plant is to build an off-site facility to turn the sludge into class-A compost that could be sold or given away. They’ll present their idea at a joint meeting of the Albany and Millersburg city councils at 5 p.m. Thursday in the Albany council chambers. The treatment plant was completed in 2010 at a cost of around $70 million. It was designed around a solids-handling system — named “Cannibal” — that turned out not to work. Since then, the plant has shipped sludge to the Coffin Butte landfill at the cost of hundreds of thousands of dollars per year. The plant was designed around the Cannibal system, and because of space constraints and other reasons, conventional treatment methods — aerobic or anaerobic digestion — are no longer feasible there. 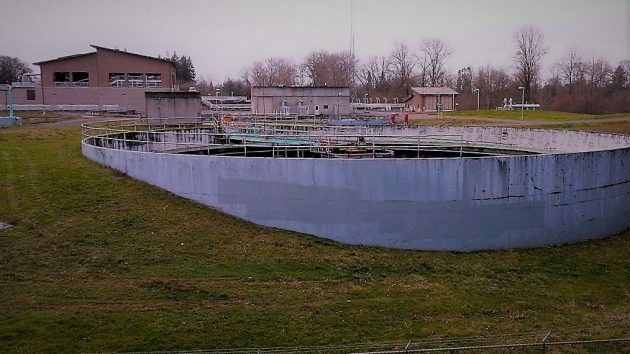 For instance, tanks previously used for anaerobic digestion are still in place, but a “primary treatment process” necessary for this was demolished when the new plant was built. The staff is asking the councils to go ahead with “pre-design” of this alternative. One of the things this effort would do is to find a place where this composting plant could be built. Apparently there’s not enough room at the treatment plant, near the banks of the Willamette river. Whaddya expect. Seems a “normal” course of business for government to fritter away our tax dollars. A recent governor wasted some $3M on a failed health care system. Who ya gonna sue? So now it seems our council was sold a “bill of goods” in crazy, unproven idea for a waste treatment facility. And these are the same people that tell us they know better as they are experienced every election time!!! Who ya gonna sue? Human waste is very toxic with pharmacuiticals, heavy metals, bacteria, virus, chemicals and everything that goes down a tub, toilet or sink. Without major treatment those thing cannot be removed from the “compost”. I know that there are bacteria that can be used to eat much of these components, but I say err on the the side saftey and have real data on what is left in the compost before you start spreading it everywhere on the ground, which eventually becomes run off to the creeks and rivers. This is another ridiculos idea just like the Cannibal system. Quit making the citizens pay for your mistakes. Look at Cities who have operating sewage treatment and use their methods. The Cannibal and this compost idea remind me of the $305 million spent on the Oregon Health Exchange failure that wasted tax payer money. Do your job and quit experimenting with our money. Apropos that an ad today deals with bacterial aids for septic systems. Spent much of my career cleaning up the detritus of judgement errors and over-optimism. Blame-storming is easy but solve the issue. Don’t assume that the manure heap in front of you can’t work until you understand how it works and what can be done to make it function better. In a few cases, the vendor sold something that hadn’t been developed, much less alpha tested. The cry “it doesn’t work” annoys me. Makes as much sense as selling a Lamborghini because one tire’s low. Think about having Republic services hauling stuff to their compost facility which is a smelly area already and let them do digesting and sell compost like they do now. Hmm … Since 2009, nine years and counting, 70 million plus another 27 million has been/will be spent. That equals incompetence to me. Please Albany City Council/Manager, recommend and replace the current incompetent staff with people that have proven experience and knowledge on how to solve this ongoing, expensive problem. Saddling Albany residents with another 27 million (likely an underestimation) with no guarantee it will work is just another patchwork level of not knowing what to do. Go back to anaerobic technology which other cities still rely on (and Albany has utilized in the past) – this solution is proven and does not involve another risk factor like the Cannibal system and will produce methane gas that can be used as a fuel source. There is plenty of room onsite to create or refurbish existing structures instead of offsite purchase of additional land, construction of new infrastructure, staffing the new facility, and hauling offensive sludge to a new compost facility. The current proposal is not a green solution by any means based on the hauling factor alone. Be prepared for additional odor complaints as more handling of raw, smelly sludge will be required with transport and processing through the City of Millersburg (a likely candidate for the compost facility location).